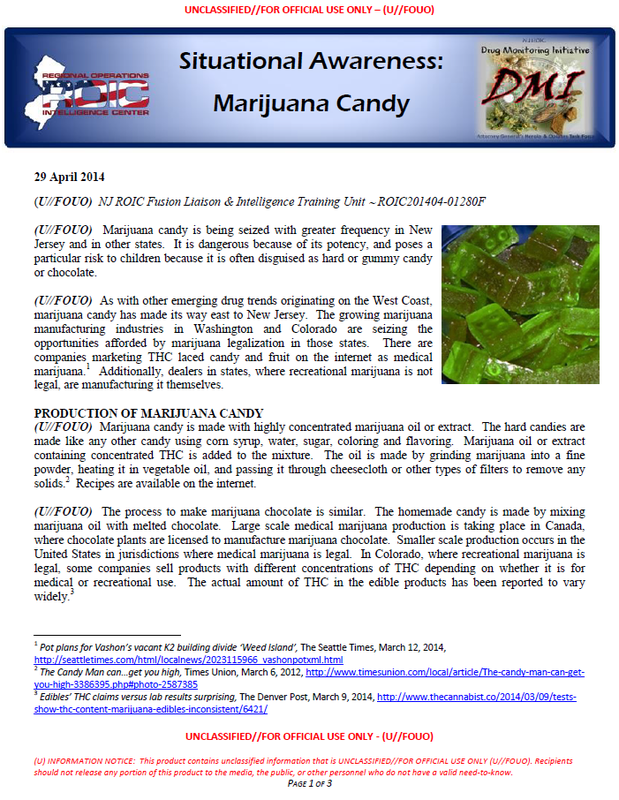 (U//FOUO) Marijuana candy is being seized with greater frequency in New Jersey and in other states. It is dangerous because of its potency, and poses a particular risk to children because it is often disguised as hard or gummy candy or chocolate. (U//FOUO) As with other emerging drug trends originating on the West Coast, marijuana candy has made its way east to New Jersey. The growing marijuana manufacturing industries in Washington and Colorado are seizing the opportunities afforded by marijuana legalization in those states. There are companies marketing THC laced candy and fruit on the internet as medical marijuana. Additionally, dealers in states, where recreational marijuana is not legal, are manufacturing it themselves. (U//FOUO) Marijuana candy is made with highly concentrated marijuana oil or extract. The hard candies are made like any other candy using corn syrup, water, sugar, coloring and flavoring. Marijuana oil or extract containing concentrated THC is added to the mixture. The oil is made by grinding marijuana into a fine powder, heating it in vegetable oil, and passing it through cheesecloth or other types of filters to remove any solids. Recipes are available on the internet. (U//FOUO) The process to make marijuana chocolate is similar. The homemade candy is made by mixing marijuana oil with melted chocolate. Large scale medical marijuana production is taking place in Canada, where chocolate plants are licensed to manufacture marijuana chocolate. Smaller scale production occurs in the United States in jurisdictions where medical marijuana is legal. In Colorado, where recreational marijuana is legal, some companies sell products with different concentrations of THC depending on whether it is for medical or recreational use. The actual amount of THC in the edible products has been reported to vary widely. (U//FOUO) Even though the marijuana candy may not appear suspicious, it still gives off a distinct marijuana odor when the packaging is opened. Drug sniffing dogs will also be able to confirm the presence of marijuana contained in candy. It may be branded and wrapped in commercial packaging, which closely resembles other known popular brands. (Photo at right). It may also be wrapped in bags or wrappers appearing to be homemade. In March 2014, Ocean Township (Monmouth County), Police seized 18 marijuana chocolate bars confirmed to contain marijuana. Also seized were 3 items described as marijuana wax. In December 2013, Wall Township Police seized 10 boxes of marijuana chocolate bars confirmed to contain marijuana. In June 2013, Long Branch Police seized 40 red candy-like cubes, similar in appearance to Jolly Ranchers, confirmed to contain marijuana. In February 2013, Edison Township Police seized 3 “Dank Grasshopper” chocolate bars suspected to contain hashish and/or marijuana. These bars are sold by Grateful Meds in Los Angeles, California. (U//FOUO) In October, 2013, West Chester University Police seized over 40 pounds of THC-laced candy from an apartment at the university. The candy was in various shapes, sizes and, colors. (Photo at right). Considering the time of year of the seizure, police were concerned that the candy could wind up in Halloween bags. (U//FOUO) In March of 2012 on the New York Thruway south of Albany, a father from Massachusetts and his daughter from Queens, New York, allegedly drove around the Northeast selling marijuana candies at “jamband” concerts getting upwards of $10 a piece for each candy. When they were stopped, they allegedly had 40 pounds of cherry, orange, root beer, sour apple, coffee, butter rum, guava, and pomegranate flavored marijuana candy along with a pound of marijuana. The two were charged with a felony count of criminal possession of a controlled substance.